We all want a little pampering. 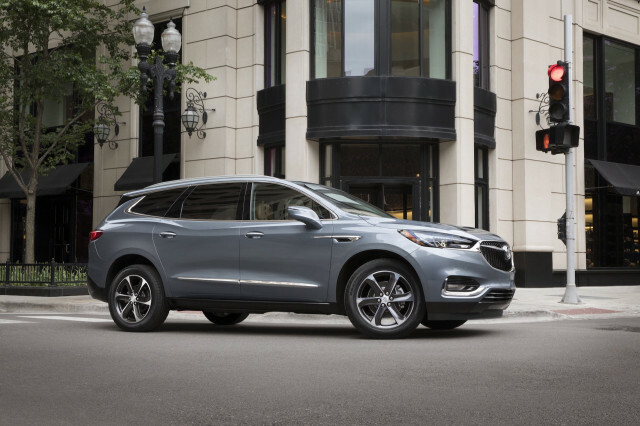 Just how much pampering is the question posed by the 2018 Chevrolet Traverse and the 2018 Buick Enclave. Under the skin, these three-row crossovers are the same vehicle. They can be ordered with the same engine and transmission and they accommodate up to eight passengers in comfort that’s above average among large crossovers. But the way they go about their business is markedly different. Overall, we rate the 2018 Traverse at 7.2 out of 10, while the plush Enclave’s softer looks, better feature set, and hushed demeanor push it to a heady 7.8 out of 10. There’s another set of numbers that most shoppers will want to consider: there’s about a $10,000 difference between the two models’ base prices. The Suburban-lite looks of the Traverse give it a more utilitarian feel than the soft, curvaceous Enclave. 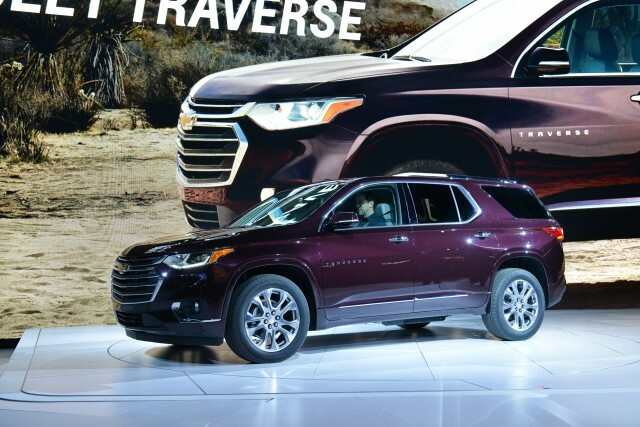 From the side, the Traverse looks elongated like its bigger (but not much roomier) Suburban sibling. Its vertical front end further emphasizes truckiness, even if that’s not backed up by off-road credentials or a tow rating of more than 5,000 pounds. The Enclave is dressier with hints of chrome and a curvy front end that could have been lifted from a Buick Regal mid-size car. Inside, the two crossovers share a number of controls and switches that reveal their shared lineage. The Enclave echoes its curvy exterior with a sweeping dashboard. It comes standard with an 8.0-inch touchscreen for infotainment that’s mounted high on the dash, but its climate controls are tucked below and can be hard to see at first glance. 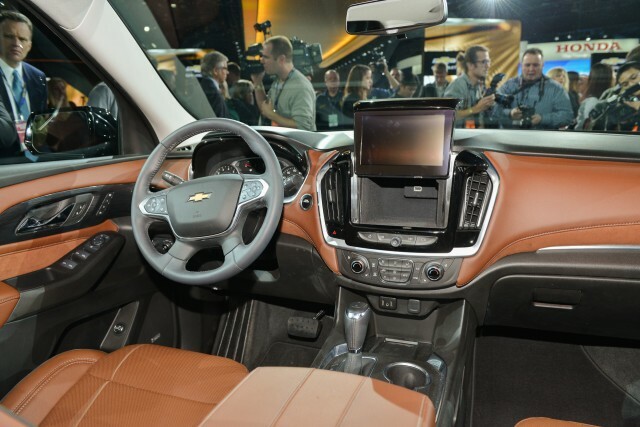 By contrast, the Traverse offers a 7.0-inch touchscreen and can be optioned up to the 8.0-inch unit. Its blockier shapes intrude more into the cabin but also put the knobs and buttons for climate controls within easy reach. Credit the Traverse for using a conventional gear lever; the Enclave’s toggle-style shift knob requires some acclimation. Both crossovers deliver similar space and comfort. Up front, the view out is good, even with roof pillars that are thicker than the Honda Pilot. Wide center consoles divide the driver from the passenger on both crossovers—don’t look for a front bench seat in these modern-day Vista Cruisers. 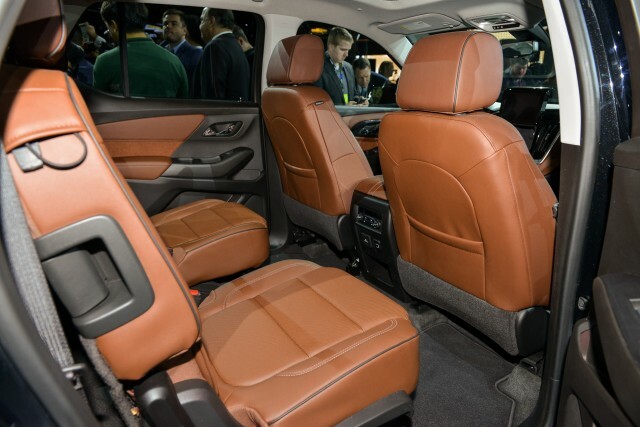 A power driver’s seat is standard on the Traverse. The Enclave adds power adjustment for the passenger as standard. Row two delivers fine accommodations with a choice of individual buckets or a three-piece bench on either crossover. A standard third-row seat gives both crossovers room for the kids and their friends, but don’t expect vacation-long luggage space behind. Both automakers list about 23 cubic feet of storage with the third row upright, but much of that is above the window. The rearmost seats are adequate for adults in a pinch, but are best suited for children. Fold the second and third rows flat(ish) and both crossovers reveal nearly 100 cubic feet of cargo space. A minivan is better, but these crossovers are toward the top of their class when it comes to hauling goodies. The majority of Enclave and Traverse crossovers you’ll find on dealer lots will have the same V-6 engine under their hoods, sending power either to the front wheels or, at the twist of a knob on so-equipped models, to all four corners. The 3.6-liter V-6 is pegged at 310 horsepower and 266 pound-feet of torque regardless of what badge is on the steering wheel. A turbo-4 paired to front-wheel drive is available on the Traverse RS, but that model will be as rare as hen’s teeth on a Chevy dealer lot. You’ll hear less of what’s going on underhood if you’re staring at Buick’s badge, though, thanks to additional sound deadening measures that add up to a remarkably quiet highway cruiser. The V-6 delivers good acceleration in both crossovers, but not the thrust of the Dodge Durango’s optional V-8. Then again, they’re not nearly as thirsty: with front-wheel drive, they’re rated at 21 mpg combined, while all-wheel drive lowers that to a still-palatable 20 mpg combined. Speaking of all-wheel drive, we take issue with the system fitted to Enclaves and Traverses. It’s positively old-school in its operation with both two- and four-wheel-drive modes. That’s handy enough for summer driving since these crossovers are ostensibly thriftier in two-wheel drive mode, but you’ll have to remember to twist the lever when the going gets slippery. Regardless of road type, these crossovers deliver a smooth, composed ride. Standard 18-inch alloy wheels on both provide the smoothest ride, but upgrading to the optional 20s doesn’t turn them into Conestoga wagons. Quick, direct steering helps these crossovers feel reasonably athletic for such large vehicles. What crash testing has been performed so far for these two crossovers has been positive. They both earn five stars from the NHTSA, albeit with a less impressive four-star score in the frontal impact assessment. Both come outfitted from the factory with a high degree of safety gear, albeit with one caveat: automatic emergency braking, a feature we think is essential for a family-oriented vehicle, is an extra-cost option walled off to higher trim levels. You’ll spend nearly $50,000 on a so-equipped Enclave, while the Traverse Premier comes in at a still-hefty $47,000 with the required Driver Confidence II package. Why pay extra for the Enclave? 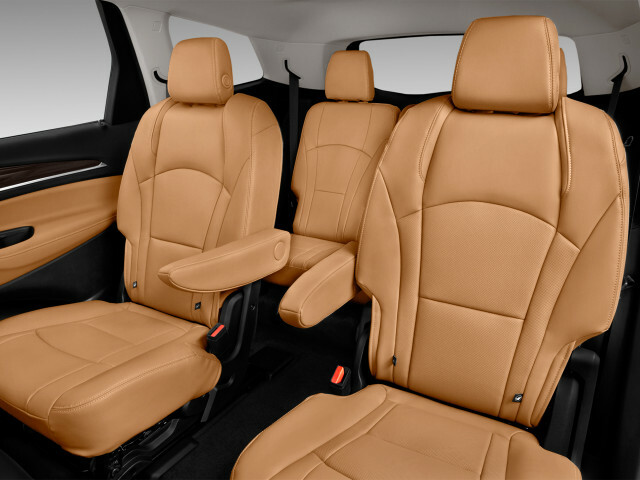 Its interior surfaces are covered in softer, lower sheen plastics and its available leather seats are nicer than those you’ll find in the Traverse. It’s quieter and, if your budget allows, the range-topping Enclave Avenir tickles Lexus luxury for much less money. There’s also the value argument: that $10,000 base price difference is whittled to roughly $3,500 for a Traverse LT Cloth that’s outfitted with heated seats, keyless ignition, and an 8.0-inch touchscreen like the base Enclave trim level. Whether that’s a big or a small price to pay for luxury is up to you. 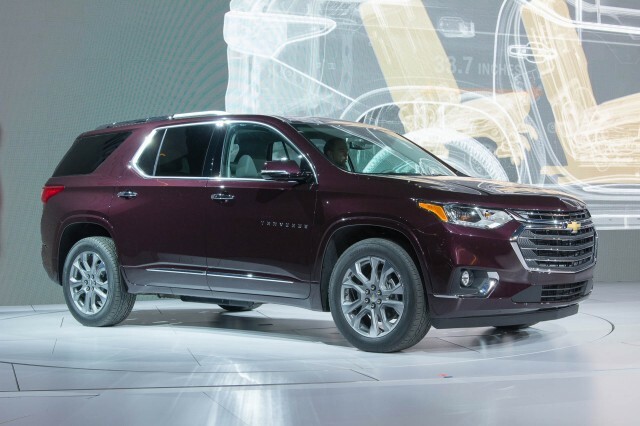 A new powertrain and crisp (but conservative) styling mean the Traverse is once again a contender in the three-row crossover race. A conservative, truck-inspired exterior contrasts with a more stylish and attractive interior for an above-average aesthetic in the 2018 Chevy Traverse. The restyled 2018 Enclave looks like the published version of the first-generation SUV’s early draft. Pleasant powertrain improvements boost the 2018 Traverse, but it’s still far off the segment’s best. 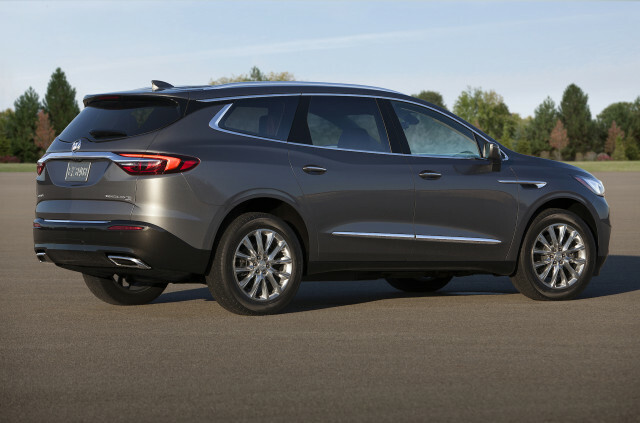 The 2018 Buick Enclave has strong acceleration, and handles like it cares about the road ahead. 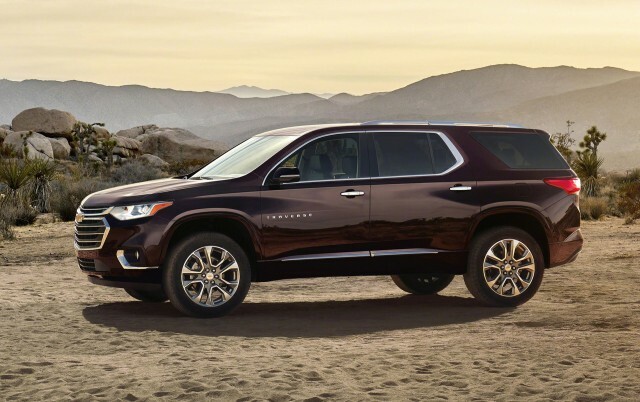 The 2018 Chevy Traverse has extremely comfortable seats and an expansive cargo area, although we wouldn’t recommend shoving adults in the very back for too long. The 2018 Buick Enclave doesn’t look the part, but it’s more minivan than SUV. The lack of IIHS or NHTSA crash testing prevents us from rating the 2018 Traverse on safety. We’ll score the new 2018 Enclave for safety once the crash-test results are in. Chevy continues to limit top-of-the-line safety equipment to range-topping trims, although there’s plenty of standard gear worth getting excited about. 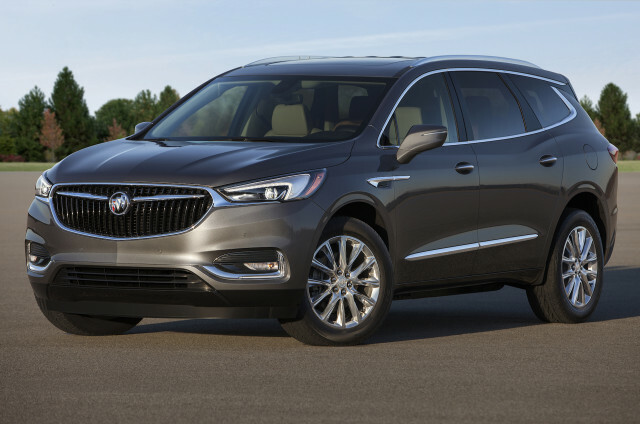 A well-equipped 2018 Buick Enclave with the latest safety technology barely slides in under $50,000. A 9-speed automatic makes up for the additional power, boosting the 2018 Traverse’s mileage modestly over last year. The 2018 Enclave boosts its gas-mileage game, though it’s still behind some rivals. 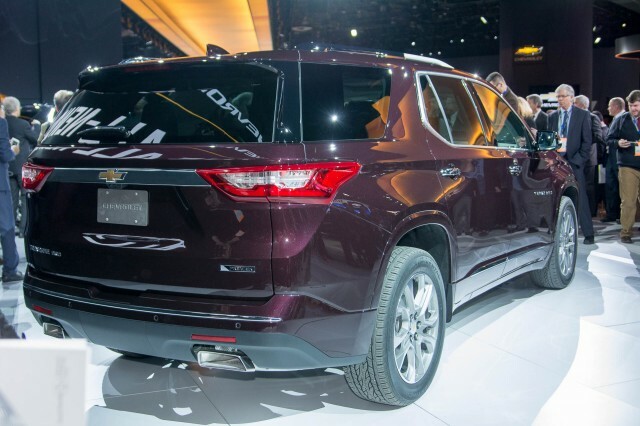 We have sent your request for price quotes on the 2018 Chevrolet Traverse and 2018 Buick Enclave to the dealers you requested. They should be in touch shortly. Your request for a fast, free price quote on a 2018 Chevrolet Traverse and 2018 Buick Enclave is in process. The CarsDirect Dealer(s) listed below will contact you shortly to discuss your request and to provide a quote.